Alright Guys. Im very happy to say that my stuttering issues are GONE! A huge thanks to Zehnsteine & msuscorpio for the BIOS!. Before this the tech support in Singapore isnt giving a good time with the diagnosis.. Had to restore back to factory settings once and to reinstall all drivers twice and still faced the stuttering issues. Now's all good. 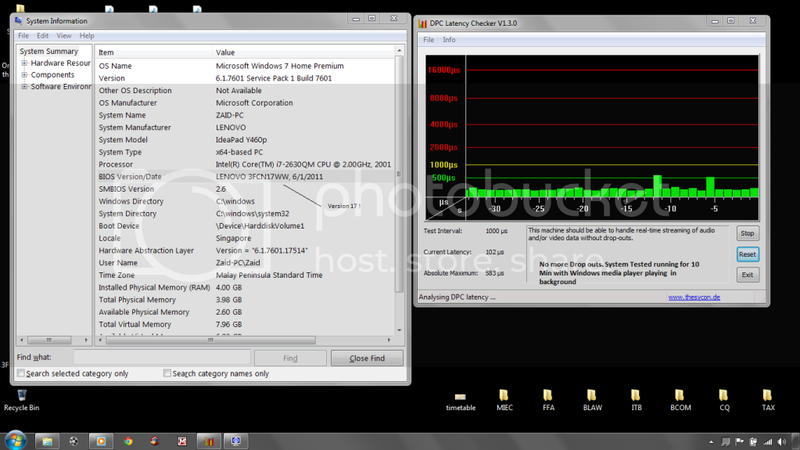 Just to share a screen shot on the BIOS version and the DPC latency in place to detect any spike. So I ran the test, just like you way you told me to Zehn, and I actually saw no red bars...they were all green. Turned off the wifi, hit the switch on the front of my machine, turned off Virus Pro, and ran a quiet song. All green bars. I have a screen shot as well. The curious thing is, sometimes, like last night when i was gaming, along with the sound stutter would come a simultaneous video sutter as well? Maybe it was just the game lag, but whenever the sound would stutter and lag, the video would lag as well. This only happens sometimes, and it seems like my sound stutter isn't consistently at 65, from what I see from the latency checker.. This is all so confusing! Maybe I have more than a BIOS issue? I was sure that it was fixed when i flashed my system..but it still comes up sporadically. here the screenshot when running the checker. so flashing with the 3FCN17WW BIOS has solved the regular sound stutter issue, which we all suffered. many times some random sound and/or video stutter is caused by buggy software, bad internet connections etc. may have to many programs running simultaneously? BTW, what model Y460p do you have... CPU, GPU, RAM, Windows-version? they have fixed some bugs in driver but kept the same version number. This laptop's great in every aspect of it.. till the stuttering came about. my Y560p was manufactured 2011-03-16 and audio driver is version 6.0.1.6220. Lenovo does obviously not believe in keeping the driver site up to date. and let's hope, life never gets more difficult than that... haha. Sure you can have my permission! Great to help others out there too.. Correct me if I'm wrong with the version. One more that though, the mute issues seems to have gone away by itself..
With your permission I would like to put part of our correspondence in forum, of course with private info's removed. once i plug it out in middle of using the laptop, i experience no sound coming out from the speaker. That only happened once after the BIOS downgrade. Bluetooth services are working OK, connected to the TV with HDMI and an external harddisk all OK. I've have yet to try others though.. I've never tried Bluetooth, never connected external monitor or eSATA device, never inserted Express/34-Card. Thank you for forwarding me the BIOS file. Just a question though, any issues faced after your flashed the BIOS to the 64 version? attached find new BIOS for Y460p/Y560p, just UN-zip to use. NOTE... if something goes wrong flashing BIOS, your machine may be ruined for good! for radio transmission, so every split second sound dropout ruined the synchronization. your experience in forum, it may help others as well. My situation is the exact same. I get DPC latency exactly every 65 seconds, and it only happens when the battery is plugged in. I called tech support, and they want me to send it to the depot where they will keep it for 7 business days. Factoring in shipping and non-business days, this is a long time to go (approaching two weeks) without my computer which I use heavily for work and leisure. d) the tech support guy on the phone kept talking about the superficial aspects of my problem (speakers, sound drivers, battery), and while I think he understood me, I can easily see the problem not really being solved if I send it in to the depot. "Well, we didn't hear any pops in the audio. We reinstalled your sound drivers." My question is whether or not there are any channels available to me to resolve this issue without it being such a distruption to my work and my personal computer use (and without voiding my warranty). Thanks in advance for any help, especially from staff. So this thread was really helpful in isolating the cause of the glitchy audio I was experiencing. Thanks to all of you for posting such good updates. Now the problem is that Lenovo tech support wants me to mail in my laptop to the depot for repairs to get this problem addressed. I don't want to update the BIOS because that will void my warranty, but I also don't want to be without my computer for two weeks so that they can do a software update. I mentioned that someone in this thread had a tech support person remote access his computer and fix it that way, but the guy I was speaking to was incredulous and even intimated that that wasn't an accurate representation of what happened. BIOS version 3FCN17WW64 can be downloaded from msuscorpio's post 27 on page 3.
and Customer Care may be seen different in different parts of this world even within the same company. BTW... what model, CPU, GPU, Win version and BIOS version is your laptop? Thanks for your help, Zhensteine. I really do appreciate the dilligence you've put into this problem. The customer service rep on the phone said it would void my warranty to install another BIOS. If there's someone here who can confirm or controver that, it would be helpful. I've got a y560p, i7-2630QM, Radeon HD 6570M, Win 7 64-bit, and 3FCN19WW is the BIOS version. I've gone with the temporary solution of disabling the battery meter, and that's fixed the problem. But I'm not sure that's a great way to leave it. Device Manager on the desktop to quickly enable Battery Meter if needed, not to bad a work-around. But then this philanthropic Tech Support person from Lenovo Thailand called me and offers to remotely update my BIOS. problem as help. With much success as you can read in this thread! "Try to update BIOS and Drivers" is a standard suggestion from moderators in this forum, maybe you have unfortunately stumbled upon an ignorant service rep who could not stand a customer telling him how to solve the issue. How about starting a new 'installing BIOS voids warranty?' thread? BTW - my Y560P Model is identical to yours.